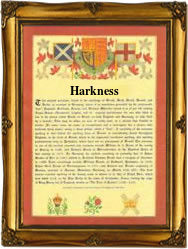 Recorded in several spelling forms including: Harkness, Hakkness, Hearkness, and Harkess, this most interesting surname is Anglo-Scottish. It is a locational name from an unidentified place but possibly the remote village of Hackness in Yorkshire. The translation of this name is 'Hook shaped headland', or the possibly as the village is well inland "the (pagan) shrine on the hook shaped hill", the second element of "naess", having varied meaning according to the specific location. As this is a locational name, that is to say a name given to people after they left their original homes and moved elsewhere, perhaps it is not surprising that in the churchyard of Dalgarnock, near Thornhill, in Scotland, are several tombstones of people of this name, who were mostly tenants of the farms of Locherben and Mitchellslacks, in the parish of Closeburn. The first recording of the surname appears relatively late, in the early 17th Century (see below), while James Hearkness married Jane Wawby at the church of St. Mary, Carlisle, Cumberland, on April 30th 1678. One James Harkness of Locherben was leader of the band of Covenanters who rescued some Covenanters from Royal troops in the Pass of Enterkin, while they were being conveyed to Edinburgh for trial, in 1684. His brother Thomas was executed in the Grassmarket of Edinburgh in 1685 for his part in the affair. A branch of the family emigrated from Dumfriesshire to Ulster in the 17th Century, and settled finally in Co. Limerick, Ireland, where the family of Harkness of Garryfine still possess lands. The first recorded spelling of the family name is shown to be that of Barbara Harkkness, which was dated June 29th 1617, marriage to Robert Dowthwaite, at St. Andrew's, Penrith, in Cumberland, during the reign of King James V1 of Great Britain, 1567 - 1625. Surnames became necessary when governments introduced personal taxation. In England this was known as Poll Tax. Throughout the centuries, surnames in every country have continued to "develop" often leading to astonishing variants of the original spelling.